The Food and Drug Administration (FDA) provided a guidance for industry in 2011 that has established a framework for process validation in the pharmaceutical industry. This guidance, titled "Process Validation: General Principles and Practices," consists of a three-stage process. The three stages are Process Design, Process Qualification, and Continued Process Verification. Although the guidance was established for the pharmaceutical industry, it also provides a useful framework for other industries. This course focuses on how to establish a systematic approach to implementing statistical methodologies into a process development and validation program consistent with the FDA guidance. This course teaches the application of statistics for setting specifications, assessing measurement systems (assays), using design of experiments (DOE), developing a control plan as part of a risk management strategy, and ensuring process control/capability. All concepts are taught within the three-stage product cycle framework defined by requirements in the process validation regulatory guidance documents. Analyses in this course use the point-and-click interface of JMP software from SAS. Apply statistics to set specifications and validate measurement systems (assays). Develop appropriate sample plans based on confidence and power. Implement suitable statistical methods into a process validation program for each of the three stages. (Stage 1, Process Design) Use risk management tools to identify and prioritize potential critical process parameters, and define critical process parameters and operating spaces for the commercial manufacturing process using design of experiments (DOE). (Stage 2, Process Qualification) Assess scale effects while incorporating large (pilot and/or commercial) scale data; develop process performance qualification (PPQ) acceptance criteria by characterizing intra- and inter-batch variability using process design data and batch homogeneity studies; and develop an appropriate sampling plan for PPQ. (Stage 3, Continued Process Verification) Develop a control plan as part of a risk management strategy; collect and analyze product and process data; and ensure that your process is in (statistical) control and capable. 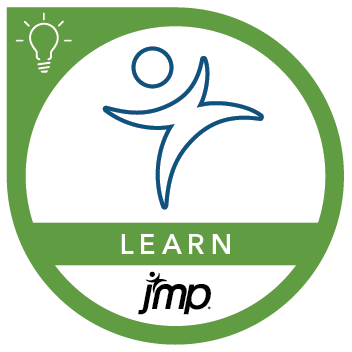 Before attending this course, you should attend the course JMP® Software: A Case Study Approach to Data Exploration. It is also strongly recommended that you attend the course JMP® Software: Statistical Decisions Using ANOVA and Regression. Statistical intervals and hypothesis testing. Establishing a strategy for process qualification. Development of PPQ acceptance criteria.